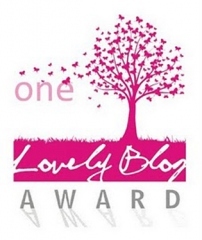 I’ve been nominated by Experience Life in France for the “One Lovely Blog” award. I see my blog as simple and nothing in-depth or as busy, as compared to others, so it is a bit overwhelming/honoured/lucky now for me, as I realize that my random musings and ramblings are reaching out to others. 1) Sincere thanks to Experience Life in France for the nomination and award. Her blog is beautifully written, a partial documentary of life in France through the eyes of a foreigner. Do visit her blog. 2) Seven possibly unknown things about myself … I think I’m running out of them and this will be a mix of what I’ve written before. I hope it doesn’t sound too boring. 1) I like puzzles – jigsaw, crossword, sudoku, etc. Sometimes I solve them, sometimes I don’t. No matter … I use enough of the little grey cells to keep it active. 5) In sixth grade, I wrote a report on the Seven Wonders of the World and said that I would visit them. Now we have a new Seven Wonders list and I haven’t been to any on the old list. Better get planning before they change the list again! 7) In this age of computers and emails, I still like to pick up pen and paper and write, doodle, draw. I also practice calligraphy whenever I can. 3) Nominate ten? fifteen? bloggers (there were different numbers in posts) – I’m discovering new ones everyday, so choosing fifteen should not be hard, but somehow it still is. Here’s a mix of new and long-time bloggers, to encourage, motivate and bring attention to their well-deserving blogs. And there they are. Enjoy them all. That’s so cool that you were all born in a different country!